Nuclear Power Plant Company Bangladesh (NPCBL) Executive Trainee(Engineering)[Mechanical], Executive Trainee(Engineering)[Electrical], Executive Trainee(Engineering)[Chemical], Executive Trainee(Engineering)[Software], Executive Trainee(Engineering)[Mechanical]/Executive Trainee(Scientific)[Electronics], Executive Trainee(Engineering)[Mechanical]/Executive Trainee(Scientific)[Nuclear], Executive Trainee(Scientific)[Physics], Executive Trainee(Scientific)[Chemistry], Executive Apprentice (Admin HR), Executive Apprentice (Accounts and Finance), Executive Apprentice (Library and Documentation), Executive Apprentice (Company Secretariat), Junior Executive Trainee(Engineering)[Mechanical], Junior Executive Trainee(Engineering)[Electrical], Junior Executive Trainee(Engineering)[Electronics], Junior Executive Trainee(Engineering)[Chemical], Foreman (Electronic), Welder, Technician (Cooling and Air Conditioning), Technician (Mechanical) and Technician (Electrical) Public Relations Officer, Personal Officer, Medical Assistant and Stuff Nurse Job Circular 2018 has been published on 08/08/2018 at The Daily Jugantor. 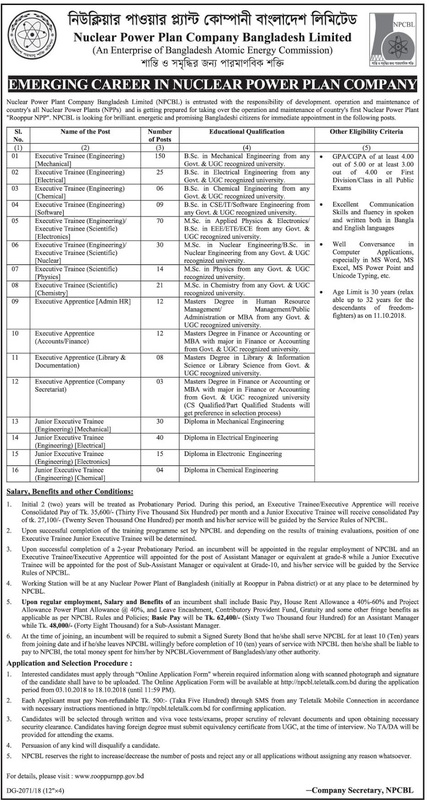 Nuclear Power Plant Company Bangladesh (NPCBL) total 21 posts are 486 vacancies are appoint. Every interested Bangladeshi person can apply for this job within specific time. Reply: Congratulations! Applicant’s Name, payment completed successfully for Nuclear Power Plant Company Bangladesh (NPCBL) User ID is (xxxxxxxx) and Password (xxxxxxxx). Nuclear Power Plant Company Bangladesh (NPCBL) authority Mobile SMS declaration will be published Admit Card. Every applicant can download login with User Id and Password at http://npcbl.teletalk.com.bd/. Nuclear Power Plant Company Bangladesh (NPCBL) authority Mobile SMS declaration will be published Seat Plan and Exam Center at your Admit Card. You can download Admit Card login with User Id and Password at http://npcbl.teletalk.com.bd/ and http://www.rooppurnpp.gov.bd/. 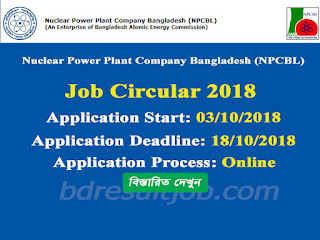 Nuclear Power Plant Company Bangladesh (NPCBL) authority will be published at their Official website notice board http://www.rooppurnpp.gov.bd/. 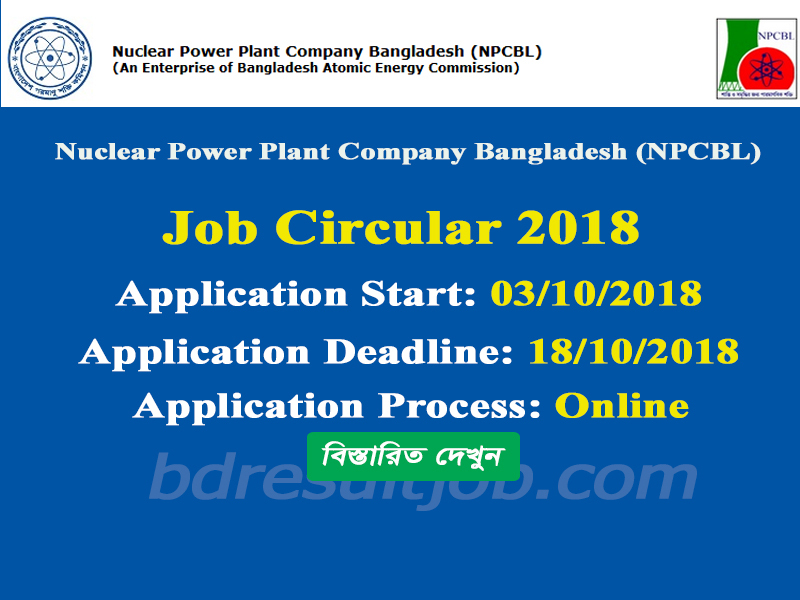 Tags: NPCBL, Nuclear Power Plant Company Bangladesh (NPCBL) Job Circular 2018, www.rooppurnpp.gov.bd, www rooppurnpp gov bd, npcbl teletalk com bd, npcbl.teletalk.com.bd, www.npcbl.teletalk.com.bd, www npcbl teletalk com bd, bd govt jobs, best job sites, job advertisement, job portal, jobs in bangladesh, latest job, job fair, new govt jobs, bdjobs career, bd job circular, bd govt jobs, latest govt jobs, job opportunities, bd jobs, job search, jobs, job, jobsite, government jobs, job vacancies, bd jobs, job search sites, job opportunities, all govt jobs, looking for a job, government jobs 2018, bd jobs government, new job circular bd, today govt job bd, newspaper job circular, latest govt jobs, govt circular bd, circular government jobs, new govt job circular in bangladesh, new job circular bd, looking for a job, new govt job circular in bangladesh, Nuclear Power Plant Company Bangladesh (NPCBL) Recruitment Circular 2018, Nuclear Power Plant Company Bangladesh (NPCBL) Recruitment Admit Card Download, Nuclear Power Plant Company Bangladesh (NPCBL) online application form 2018, NPCBL Exam Result 2018. 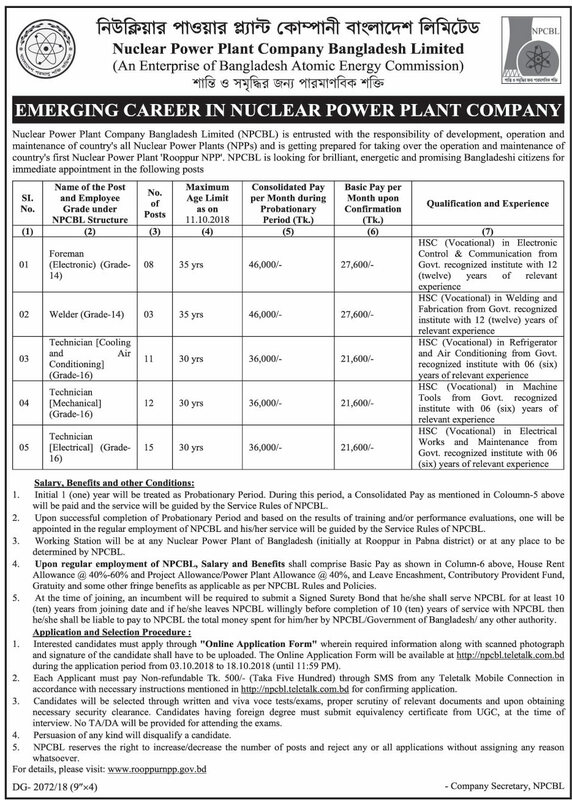 NPCBL, Nuclear Power Plant Company Bangladesh (NPCBL) Job Circular 2018, www.rooppurnpp.gov.bd, www rooppurnpp gov bd, npcbl teletalk com bd, npcbl.teletalk.com.bd, www.npcbl.teletalk.com.bd, www npcbl teletalk com bd, bd govt jobs, best job sites, job advertisement, job portal, jobs in bangladesh, latest job, job fair, new govt jobs, bdjobs career, bd job circular, bd govt jobs, latest govt jobs, job opportunities, bd jobs, job search, jobs, job, jobsite, government jobs, job vacancies, bd jobs, job search sites, job opportunities, all govt jobs, looking for a job, government jobs 2018, bd jobs government, new job circular bd, today govt job bd, newspaper job circular, latest govt jobs, govt circular bd, circular government jobs, new govt job circular in bangladesh, new job circular bd, looking for a job, new govt job circular in bangladesh, Nuclear Power Plant Company Bangladesh (NPCBL) Recruitment Circular 2018, Nuclear Power Plant Company Bangladesh (NPCBL) Recruitment Admit Card Download, Nuclear Power Plant Company Bangladesh (NPCBL) online application form 2018, NPCBL Exam Result 2018.